When filmmaker T.C. Christensen asked local pianist Paul Cardall to compose music for Christensen&apos;s upcoming film "Ephraim&apos;s Rescue," Christensen said he had no idea how meaningful his request was.The film chronicles one of the iconic moments of the immigration to Utah of early converts to The Church of Jesus Christ of Latter-day Saints. In 1856, former Mormon Battalion soldier Ephraim Hanks helped rescue the Martin and Willie handcart companies. Nearly 1,000 handcart pioneers on their way to Utah became stuck east of the Rocky Mountains with little food and harrowing blizzard conditions. More than 200 people among those companies died, but among those who survived was James Laird and his wife Mary Rennie ‚ with her four-year-old son Edward walking by her side and a new baby in her arms. They had left the British Isles to come to the Mormons&apos; promised land of Utah.Although he died long ago, Edward is no mere ghost to CardallHe was Cardall&apos;s great-great grandfather, and delivered from death by Ephraim Hanks. "A lot of kids referred to [Hanks] as Santa Claus for the rest of his life," said Cardall, 40, an avid student of Mormon and Utah history. He is best-known for being a best-selling musician whose thirteenth studio album, "New Life," debuted as the No. 1 Billboard New Age album in February 2011 and held a position in the top five for more than 30 weeks, topping the numbers of both Enya and Yanni&apos;s new releases.Listening to the film&apos;s soundtrack  which is now in stores, released by Shadow Mountain Records  rapidly reveals that this is among Cardall&apos;s most personal works in his life, a life that has brought him to his knees in despair as well as the mountains of joyful reverence. 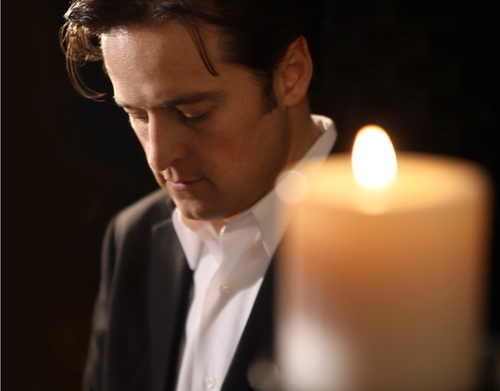 The opening track, "Traveler"  featuring one of The Piano Guys, Steven Sharp Nelson  too represents a meaningful familial connection for Cardall. The song is based on a song written by his late brother. Brian Cardall. Brian is, unfortunately, most remembered for dying on a the side of a southern Utah highway in 2009 after being delivered two shocks from a Taser pistol in the midst of a bipolar episode. (The widely reported death spurred the Utah State Legislature to pass a resolution encouraging police departments to provide officers with better training in how to respond to people with mental illness. )But Paul wanted Brian&apos;s talents to be showcased, and to be remembered as his family remembers him  a talented and creative young man, husband and father who shouldn&apos;t have needed to be rescued.It was "Traveler" that first convinced Christensen to tap Cardall as the composer for his film. Darin Southam, a Vernal native who portrays Hanks in the film, recommended Cardall to Christensen, who was looking for music to accompany the film. "I&apos;ve always loved his stuff," Southam said, and told Christensen to listen to Cardall&apos;s "New Life. ""Traveler" is also the first track of "New Life. "Christensen said he found "Traveler" to be incredibly moving, and from the first time he heard it he knew it would fit in well with the theme of his film. "I didn&apos;t know anything about [his brother or ancestors]," Christensen said. He wasn&apos;t drawn because of any connection that Cardall shared with the film&apos;s subjects. Christensen simply loved the music.So "Traveler" became the cornerstone of the music Cardall composed for the film, with much insight about his brother as well as his descendants. His grandmother told him stories about the handcart rescue when he was younger, and he spent time researching the life of James Laird, was born on Christmas Day in 1825. James&apos; father was a Methodist minister, and James ran away from home, at one point saying that he did so because his father read the Bible too much. "Imagine a Mormon saying that," joked Cardall.Cardall was inspired by the hardships that his descendants endured. "I feel a closeness with the pioneers," he said, explaining songs on the soundtrack such as "Life and Death," "Drowsy Maggie" (written by Utahn Aaron Ashton), "My Kindness Shall Not Depart From Thee" (featuring singer and Green River native Dallyn Vail Bayles) and "Come, Come, Ye Saints" (written by Nelson). "I have a lot of pride in my Mormon ancestry. "A sobering thought recurred during the recording and writing process, which also included contributions from local favorite Ryan Shupe, Marshall McDonald, Trevor Price and Rob Gardner. Cardall knows that had he been in James&apos; stead, he would never have survived the long trip across the Plains.Cardall was born with congenital heart disease. He received a heart transplant in September 2009 after spending 385 agonizing days waiting for a match at Salt Lake City&apos;s Primary Children&apos;s Medical Center. "New Life" is, appropriately named, the album he wrote and recorded after the transplant.Southam said Cardall&apos;s life itself should be a film, but for the time being, he is content to listen to Cardall&apos;s soundtrack and let it tell his family&apos;s story. Listening to the music, Southam said, "makes you want to see the movie. I cried when I listened to it." The effect the music had on Southam reminds of the time be bought the soundtrack to the Russell Crowe-starring film "Gladiator," with its stirring score and music composed by Hans Zimmer and Dead Can Dance&apos;s Lisa Gerrard, before the film was released. The music was so powerful that he felt compelled  obliged, even  to see the film.Now, with the film due out soon, Cardall can look back on his life and the adversities he has endured.During the moments when Cardall was lying in a hospital bed, near death, he asked himself, "Where does strength and resilience come from? "He now knows the answer. "It&apos;s in our blood," he said. He survived, and has survived, because he shares the same blood as James Laird and Mary Rennie and Edward.